The vegetable garden is now virtually empty, so the pantry or store cupboard is regularly raided, and baking cakes and breads have become the norm at The Pumpkin Patch. Before Christmas, gingerbread cookies and shortbread were a hit, easy to make, easily made into all sorts of seasonal shapes & virtually impossible to get wrong yet really tasty. I mentioned the garden being empty, it is empty-ish, but not quite. We made ‘Cawl’ last week, and totally forgot to buy leeks, I was so disappointed. Cawl just isn’t cawl without leeks. Anyway, somehow it suddenly dawned on me that I had a whole patch of the garden dedicated to leeks and I’d hardly harvested any of them. With all the recent rain, wind and drizzle, i’d totally forgotten about them. 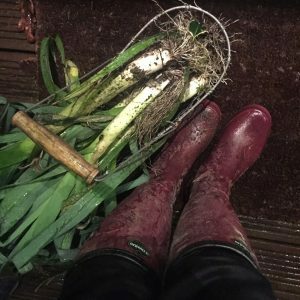 So torch in hand, wellies on, coat over apron, I ventured out into the black night to pick a few leeks! The cawl was great, just what the doctor ordered during the coldest week of the year to date, and made all the more special for the effort made to get the ingredients.